Plan your Holiday in Normandy, in the Pays d’Auge region, day by day. Explore flashy Deauville, the exclusive fishing port of Trouville, Cabourg retracing Proust’s steps, picturesque Honfleur, Houlgate and its Belle Epoque villas, Villers-sur-Mer and its dinosaurs, Ouistreham and its scallops . Whether on a quick detour or a planned visit, indulge in a bit of shopping in Cambremer’s shops or at one of the local markets in preparation for a picnic on the sand or at the side of a meadow. And of course, wash it down with a delicious glass of Vintage Cambremer Cider AOC Pays d’Auge. Visit Beuvron-en-Auge, which is classified one of “Les plus beaux villages de France” (“Most Beautiful Villages in France”), with its Info Point and boutique devoted to the “Cider Route” and footpath to the viewpoint at the chapel of Les Forges de Clermont; Cambremer and the magnificent garden “Jardins du Pays d’Auge”; Pont l’Evêque, which is on the trail of the “douets” (“brooks”), Beaumont-en-Auge and its artist boutiques; Val Richer and its rolling countryside; the region’s magnificent country churches and characteristic small “mairies” (“town halls”). But that’s not all: the Pays d’Auge, and particularly the Cambremer area, sums up the French countryside of your dreams in terms of a relaxing holiday: preserved wooded landscapes, sweet grasslands, Normandy cows with their promise of delicious cheese, elegant horses to look out for on the racecourses, apple and pear orchards, peaceful and well-maintained hamlets, timber-framed or Caen stone houses, thatched roofs, gurgling streams full of fish, dream manor houses at the end of narrow drives, gites and warm B&Bs. And that’s not forgetting the renowned gastronomy. No trip to the Pays d’Auge would be complete without a visit to the producers on the Cider Route. 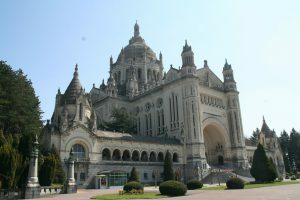 Discover the cathedral of Saint-Pierre, Carmelite convent where Saint Thérèse of Lisieux lived, basilica, and traditional Saturday morning market. Then head to the nearby Domaine de Saint Hippolyte (with its excellent dairy, manor and outbuildings) and the castle of Saint-Germain-de-Livet. Livarot, Pont l’Evêque, Camembert, and Vimoutiers cheeses are renowned for their taste. We recommend a little detour to discover the priory of Saint-Michel-de-Crouttes. 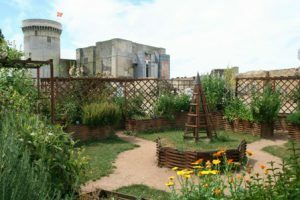 Explore Crévecoeur-en-Auge, Saint-Pierre-sur-Dives (with its abbey church and medieval covered market), Mézidon-Canon, Vendeuvre, Falaise (home of William the Conqueror’s castle, a robot museum and a museum dedicated to the civilian victims of the 2nd World War). If you go a little further, you will come to Norman Switzerland, which boasts beautiful nature walks such as the one to the Rock d’Oëtre. In the town of Caen, you can visit the ducal castle, the Abbaye-aux-Hommes and Abbaye-aux-Dames, the Peace Memorial Museum, its pedestrianised centre and restaurants. Across the Normandy Bridge is Le Havre (which is not just an ugly port: do not miss the André Malraux museum with the exceptional view of the dock from its restaurant, the Perry Show Flat, the town centre shops, beach or marina), Etretat and its cliffs, Fécamp and its Benedictine Palace. For those wishing to go further, Dieppe, Eux and Le Tréport are not far away. The Landing Beaches stretch as far as Pointe du Hoc by way of Bayeux (historic town, cathedral, Bayeux tapestry) and Port-en-Bessin (fishing port). 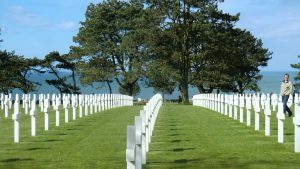 Places of interest include Omaha Beach, the American cemetery in Colleville-sur-Mer and the German cemetery in La Cambe, the unmissable museum on Pegasus Bridge, Arromanches, and all the museums along the coast. Don’t forget to visit the very interesting museum in Falaise dedicated to the civilian victims of the war.